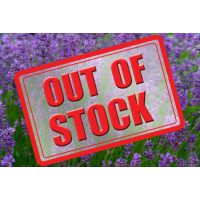 Chives are a bulb-forming herbaceous perennial plant, growing to 30–50 cm (12–20 in) tall. The bulbs are slender, conical, 2–3 cm (3⁄4–1 1⁄4 in) long and 1 cm (1⁄2 in) broad, and grow in dense clusters from the roots. The scapes (or stems) are hollow and tubular, up to 50 cm (20 in) long and 2–3 mm (1⁄16–1⁄8 in) across, with a soft texture, although, prior to the emergence of a flower, they may appear stiffer than usual. 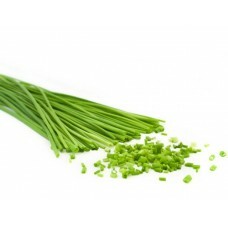 The leaves, which are shorter than the scapes, are also hollow and tubular, or terete, (round in cross-section) which distinguishes it at a glance from Garlic Chives. The flowers are pale purple, and star-shaped with six petals. Cut leaves for salads, potatoes, soups. 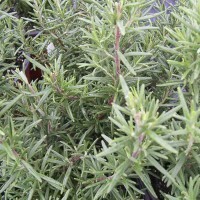 Rosemary is an essential ingredient and adds wonderful flavor to meats, other poultry and vegetables..